Channel 10’s EPG is missing in action. Channel 7’s is just 12 hours late. The time code says 10.30pm, but Now On says ‘10.30 Seven Morning News’. Apparently there’s nothing ‘Coming Up’ – that bit is blank. Yet again one wonders, whatever the marketing hype about digital TV and HDTV, how on earth us poor mugs are supposed to know what actual programs are on and when. 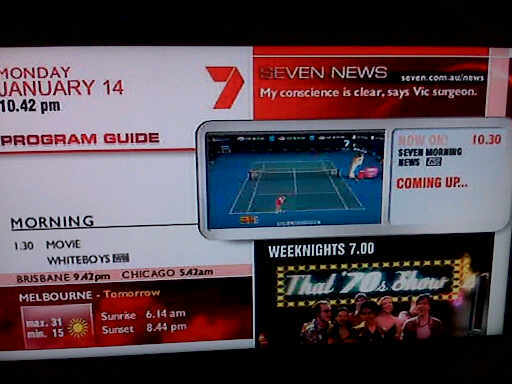 Channel 7 is launching Tivo soon. If they cannot produce a reliable basic EPG it shreds one’s confidence in their ability to run the infinitely more complex programming dataset required by Tivo.